I remember when I heard that they were tearing down the Training Table (located where JCW's is now), I was really devastated, not because it's a classic establishment, but because of the cheese fries. They were mine and Owen's first cheese fry experience together, and it was incredible. Something about fried potatoes and melted, greasy cheese is just the ultimate fatty indulgence to me. They were even better than their predecessors. These aren't your typical cheap-o fries with a little nacho cheese on top. No way. The fries are thick and rustic, with perfect crisp. And the cheese, oh the cheese. 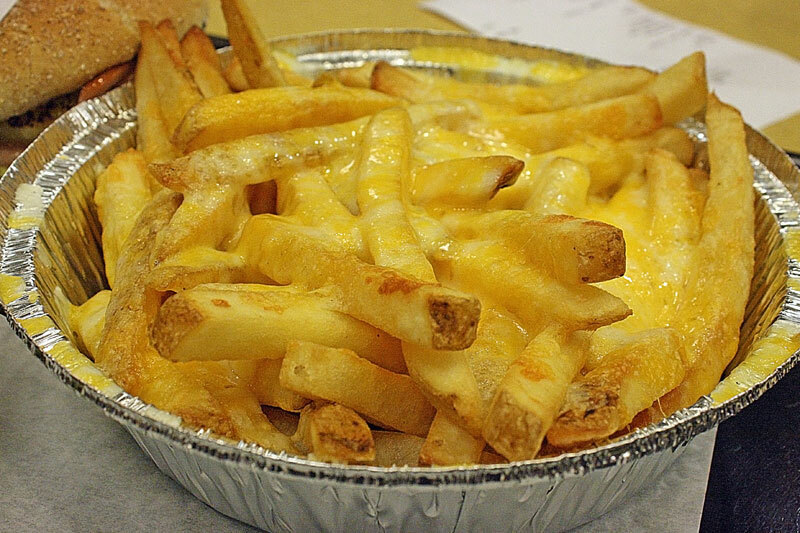 They use a mix of shredded cheeses and then melt them in some type of oven so that the fries remain perfect. There is a ton of cheese so Owen and I don't even have to fight over the best pieces, and it is an enormous portion size. These are amazing. I crave them like you wouldn't believe. Poor Owen. Whenever I am pregnant someday, he's going to have to deal with my demands for the craziest of food cravings...they are bad even now! 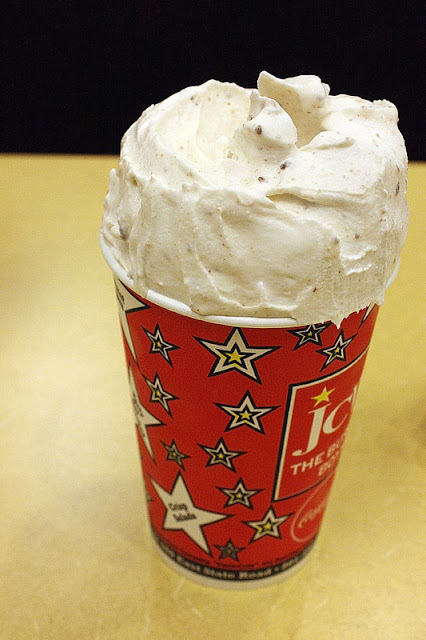 This is the "small" milkshake! Ha! Not small! Delicious and huge! The Kit Kat one actually wasn't my favorite flavor, but when we ordered the Almond Joy milkshake on our first trip, I was impressed by the amount of chocolate and coconut in the shake. This is how a milkshake should be (in my opinion). Thick and creamy, you have to spoon it out when you're starting your meal. Then by the end of your meal, you can grab a straw and slurp up the heavenly sweet milkshake remains. And it can easily be shared by two people. 10 out of 10 my friends. And then, the burgers. Owen and I were trying to figure out where our favorite burger places were, and Owen said that he's decided on JCW's! 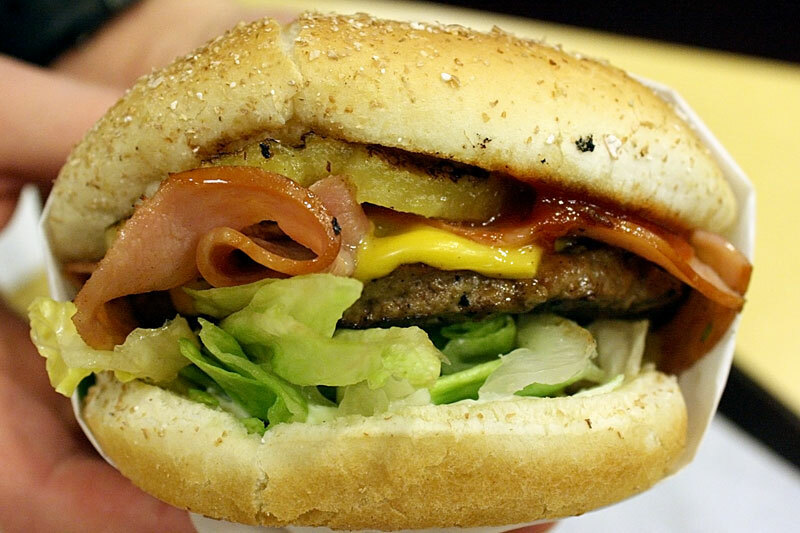 (my favorite will be coming soon, no worries :) I love the buns here -- with a little cracked wheat on top, you can almost pretend like there is something healthy and wholesome about this burger. The toppings are fabulous -- I loved my grilled pineapple, and they actually put on enough ham that I could taste it! Amazing! I am not sure if the cheese is "real," but it actually melted on the burger. Yay. Look at all that bacon. Wow. And the jalepeños were pickled, not fresh, so they were SPICY! 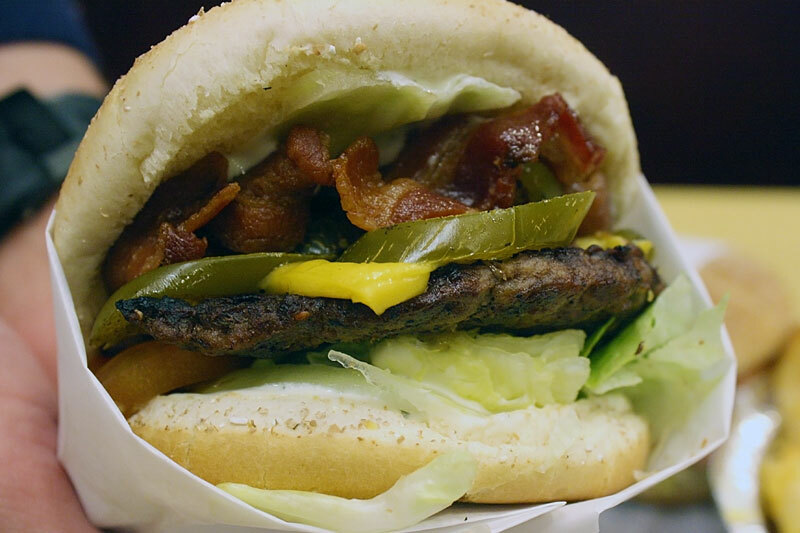 This may be Owen's favorite burger of all time. The burger itself wasn't especially thick, but it was flavorful and pretty moist. Honestly, we were both so full after inhaling the cheese fries and a third of our milkshake, that we could only eat a few bites of our burgers! We ended up taking them home, even though I wasn't sure if they would make very palatable leftovers. But if you heat up the burgers over a low heat (250 degrees-ish), then the bun remains crispy and it was actually pretty good!